First, the basics: all Nissan 350zs use a 5×114.3 bolt pattern. Are you using these wheels for daily driving? Are you using these wheels to race? These factors will help you narrow down your options. If you’re buying wheels just for daily driving, weight probably isn’t much of an issue for you. But if you’re using your wheels for racing, you’ll want lightweight wheels, preferably forged, as they’re stronger and sturdier. Forged wheels are much more expensive than cast wheels, though. So if you’re on a strict budget, that probably eliminates about half of your options right out of the gate. After you make your decisions on those three questions, you need to decide what wheel size and offset will go best with your 350z. 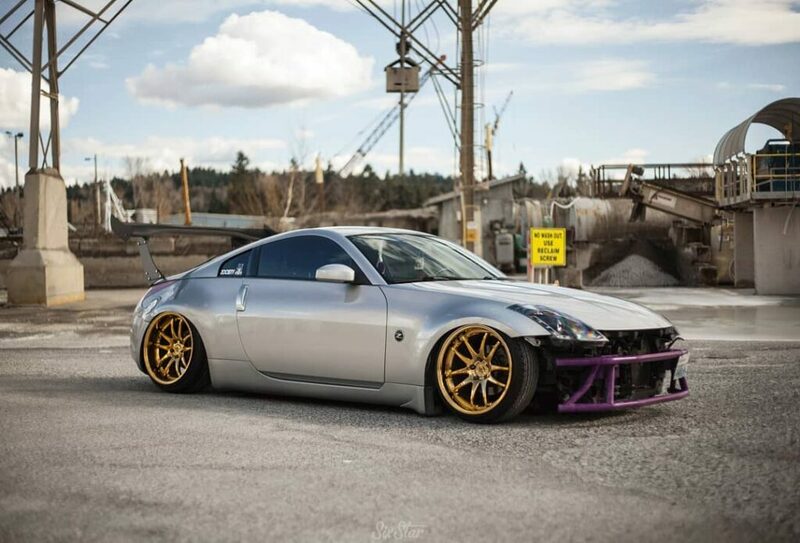 While some 350z models come with 17″ wheels from the factory, almost all owners end up upgrading to 18’s, if not larger. Generally if you’re heading to the track, that’s as large as you will use as getting maximum traction and keeping tire costs down is more important than looks. On the street though, 19’s are much more common. Most people run widths between 8.5″-9.5″, with around 9″ being the sweet spot. Square vs staggered setups are a hotly debated topic. 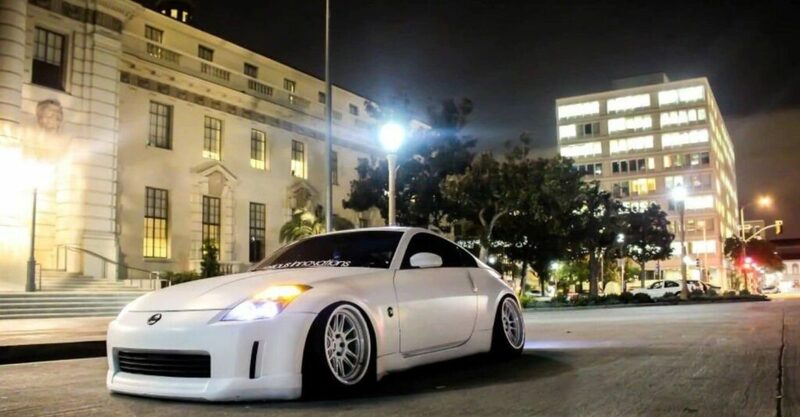 While some 350z owners like being able to rotate their wheels front to back, some will use smaller wheels in the front (19×8.5”, for instance), and larger wheels in the back (19×10.5”). These fill the guards a bit better and can help with handling. You can go larger than these sizes a 20×11″ for example, but they will not fit without custom work like fender rolling. You may need spacers, and you’ll almost definitely need coilovers with nice thin linear springs to fit a wheel in that sort of width. The offset of a wheel is the distance from its hub mounting surface to the centerline of the wheel. The 350z has wide “hips” and a low offset. 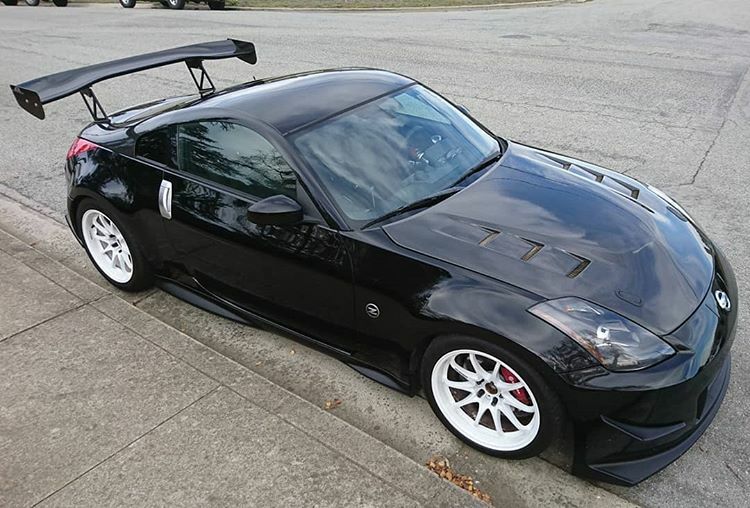 Many aftermarket wheels have a lower offset than stock Z33 wheels would, but we’ve made sure to include only wheels that will fit (and look good) on your Z car. If you’re racing your 350z, you’ll probably want a more aggressive, low offset, somewhere in the +10mm to +25mm range. With these offsets, your wheels might require a slight fender roll to fit. High offsets of +40mm or more are at risk of not clearing the OEM Brembo brakes or other big brake kits, depending on the calipers themselves, wheel lip size, and spoke design. Stick with a lower offset and you should be fine. Offsets in the +25mm to +35mm range are generally considered safe, where a fender roll won’t be necessary. These offsets are more common for daily driving wheels, but people also use them for racing when their car doubles as a street car too. These wheels are all lightweight (some more than others), with varying sizing options (typically in the 18-19” range in diameter and 8.5-10.5” range in width) and offsets. We’ve cherry picked wheels that are good for racing and daily driving. 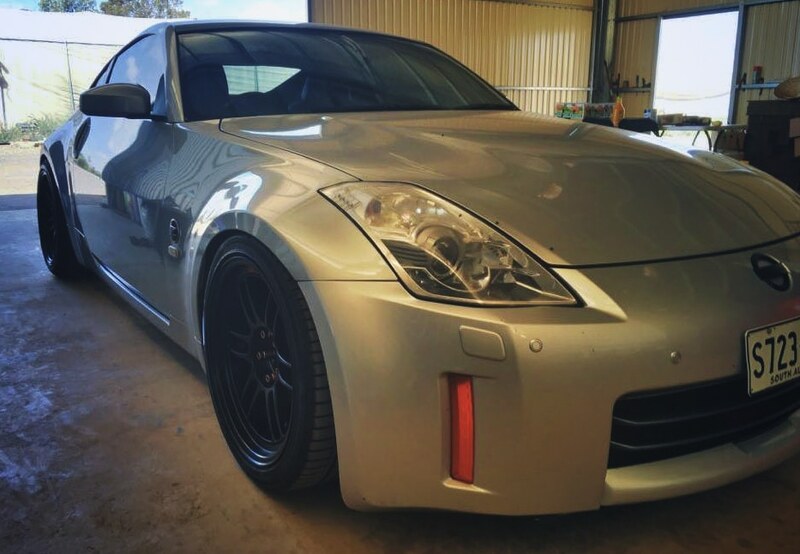 Given the Z’s racing heritage, we think proper performance wheels are the right ones to be putting on a 350z – not some something cheap and blingy. 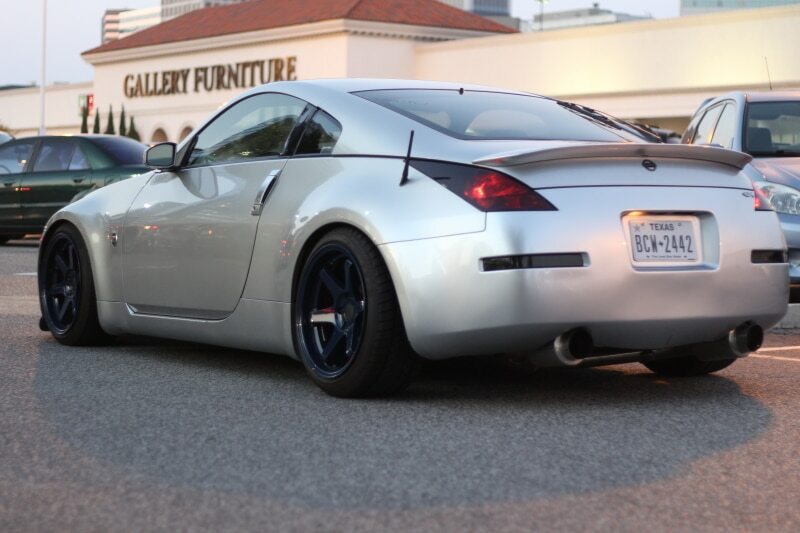 These 10 wheels are some of the best wheels for Nissan 350zs that you’ll find. 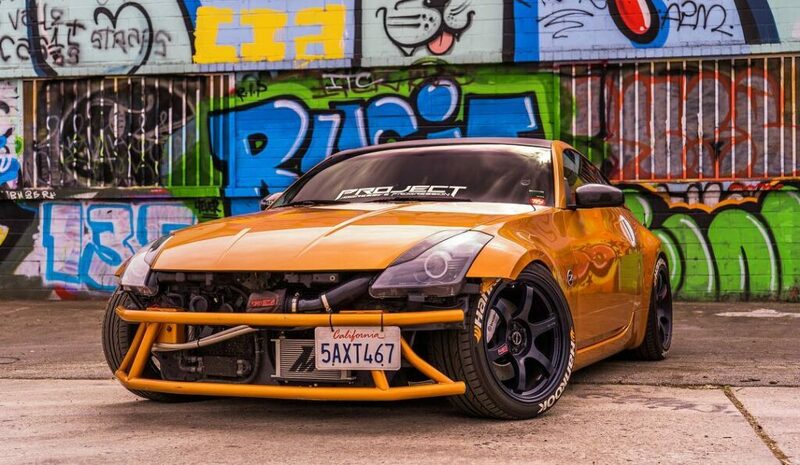 The Enkei RPF1 wheels are some of the most popular, highly rated wheels on the market for 350z enthusiasts. They’re lightweight and aggressive looking, but have all the functionality of high quality race wheels. Enkei uses a dual, open stance 6-spoke design to make the wheels more rigid, with better stress dispersion, and to allow for harder braking and better handling. These are some of the best 350z rims around for the racetrack. A lot of 350z owners will run RPF1s in 18×9.5” up front and 18×10.5” in the rear. You will need to roll your fenders with this setup. Personally we like the “square” setup, in 18×9.5 front and rear. These wheels are also available in +38mm offset, but the more aggressive +15mm is more widely used on tuned, modified 350zs. Their low offset widens your track nicely, helping your car to be much flatter through the turns. Volk Racing’s TE37 TTA wheels are rather new, having only been out for five years. They were engineered by RAYS, and are based on the iconic TE37 forged monoblock wheel, which has since been discontinued. The TE37 basically set the standard for what a performance wheel should be. The TE37 “Tokyo Time Attack” wheels feature a glossy face and polished lip, and a unique color scheme. The new diamond cutting process gave the forged lip a mirror look, and the wheels also carry a larger lip than previous TE37 models. TE stands for “Touring Edition,” and 37 stands for the weight of the original TE37: an unprecedented 3.7kg (8.15 lbs) per 15” wheel. These wheels aren’t only head-turners, they’re also extremely good for track racing. With the proprietary, 100% aluminum blend used to forge these wheels, they are one-of-a-kind rims that are both tough and rigid, and also weigh very little. The most popular size and offsets for 350z enthusiasts would be 18×9.5” with a +12mm offset (typically for the track), and 19×9.5” (+22mm) or 19×10.5” (+22mm) for street use. 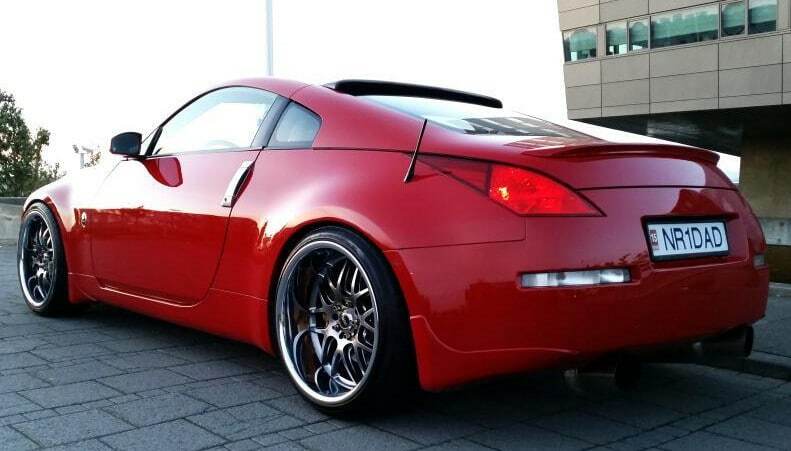 For the 350z, the 57DR wheels come in three width sizes, all on 18” rims. They are 8.5” (+30mm offset), 9.5” (+12 or +22mm offset), and 10.5” (+12 or +22mm offset). Like many performance oriented wheels, the 350z is best suited to use larger wheels in the rear, so your will be most likely to run 18×9.5” in the front, and 18×10.5” in the back. If you’re going for a square setup though, 18×9.5″ +22mm all-round is a safe choice. These wheels use a similar 6-spoke design as the infamous Volk TE37 wheels, though these are less than half the price (but without sacrificing quality). 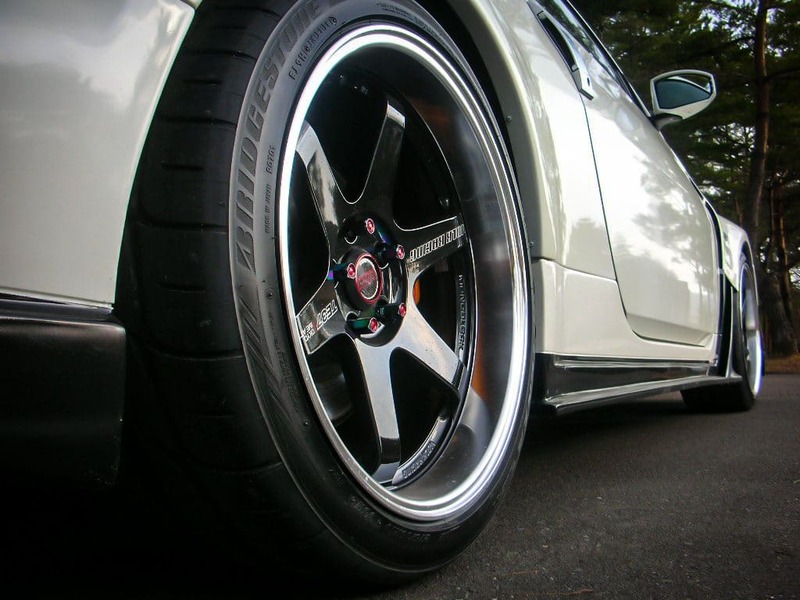 For one-piece, cast construction wheels, the 57DR are some of the best 350z rims you’ll find. They’re very lightweight (like all RAYS wheels), yet sturdy and dependable. They also come in more colors than any other wheel (11 in all! ), including outrageous colors like red and fluorescent pink, making them suitable for any 350z. The XXR 526 wheels came out in 2011 to much fanfare. They’re cast aluminum wheels with a triple plated chrome lip that creates a huge, wide lip depth, making them very aggressive and unique looking. The split 7-spoke design also helps give them a unique appearance, and makes them sturdy and rigid, too. The best 350z wheel setup (and most popular) using the XXR’s 526 is probably 18×9” +25mm all-round, but some people will go for 10.5 on the rear. The latter is an aggressive setup though, and fender rolling not a “maybe”, you’ll definitely have to do some fender work. These are also cheap 350z wheels, costing just a fraction of high-end Japanese wheels like those by Enkei and RAYS. Because of that, they’re quite a bit heavier than other performance oriented 350z wheels, making these best for daily drivers that want to stun passersby with looks. Varrstoen’s ES2 wheels are a 6-spoke concave design that will make your 350z shine. They’re available in all sorts of sizes, though we’ll stick to 18” and 19” for the 350z. These wheels have actually been discontinued by the manufacturer, which is a real shame. Thankfully, you can still pick them up around the place – if you can find a set, jump on them! The offsets for the ES2 come in multiples of five, starting at +15mm (+20mm, +25mm, +30mm, etc.) with the exception of the +12mm and +22mm wheels. 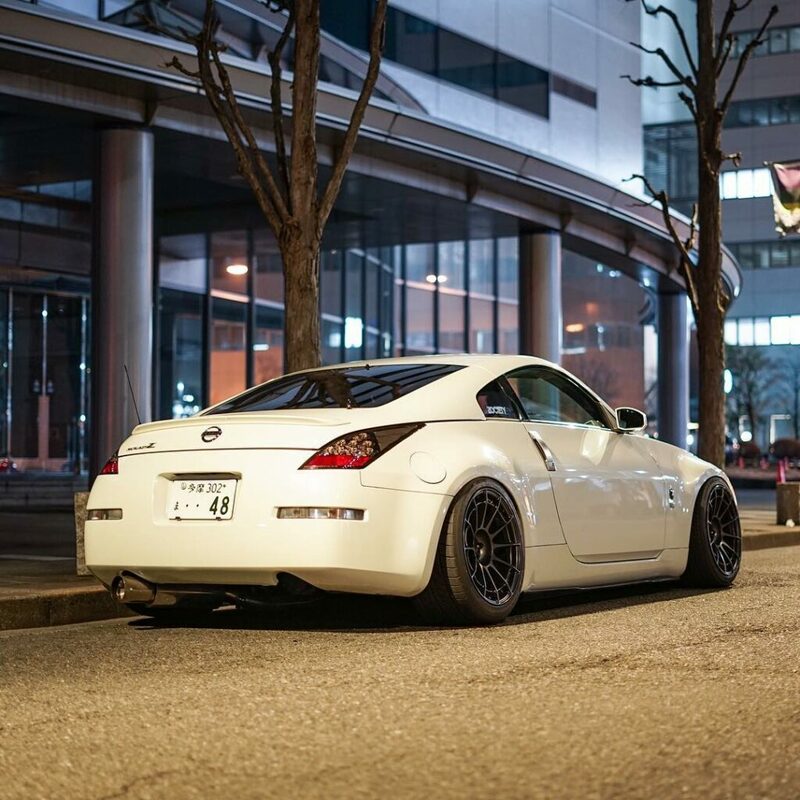 The most common ES2 wheels used by 350z owners are either 19×9.5” or 19×10.5” with a low offset, or 18×10.5”. ES2.2’s in these sizes look amazing on a lowered Z. 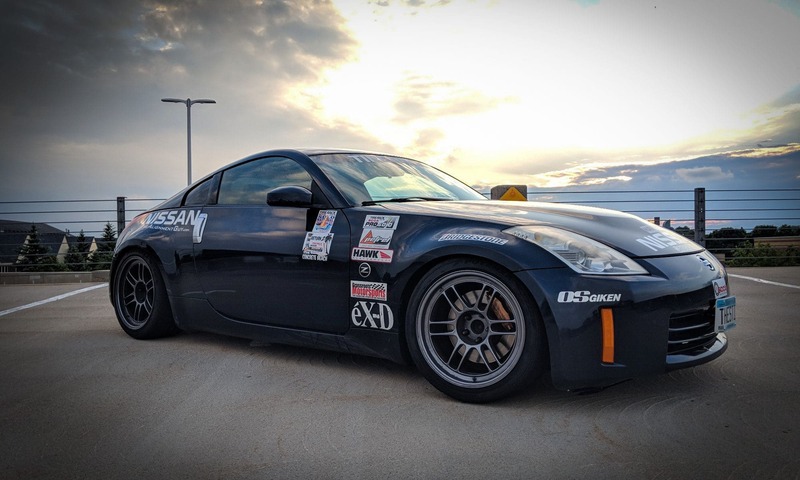 These wheels are used by racing teams all over the world, so you can be sure you’re getting some of the best 350z wheels on the market, that are very well built. SSR offers these GTX01 wheels with a beautiful 10-spoke design, giving them a very modern look. They’re made using “Flow Forming Technology,” making them lightweight wheels that use less material but retain high strength properties. They come in various sizes, though as usual, for the 350z you should use mid- to larger-sized wheels: 18×9.5” (+15mm or +22mm offset), 18×10.5” (same offsets available), or one of the 19” sizes. The widths for the 19” wheels are 8.5”, 9.5”, and 10.5”, with offsets ranging from +22mm with the widest wheel, to +45mm for the skinniest. Many 350z enthusiasts use these wheels on their daily drivers, though they’re definitely light and strong enough to take on the track. Cosmis Racing’s XT206-R wheels are cheap 350z rims that come in a multitude of colors (as many as the Gram Lights 57DR, in fact), and some odd sizes. There is no 19” wheel available though, which is pretty much the standard size for tuned 350zs. 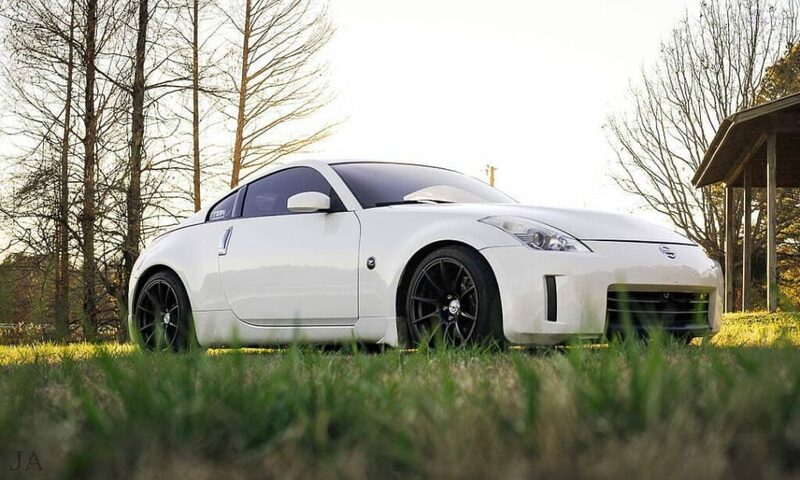 The 20” wheels aren’t necessarily too big for the 350z, but they aren’t our first pick. And the 11” wide rims are reserved for the rear end of slammed 350z’s with super stretched tires and lots of camber (coilovers are good for this setup). If you’re not up for the challenge of fitting monster wheels, stay safe with the 18×9.5” +33mm wheels. They’ll look great, especially if your car has a slight drop using coilovers or lowering springs. These wheels are built using a split 6-spoke design, a classic design that helps with stress dispersion and sturdiness. The Aodhan DS-02 wheels feature an open, concave, twisted 5-spoke design with a deep dish lip. You wouldn’t know how cheap they are by looking at them. They are pretty popular among 350z enthusiasts, though Aodhan isn’t as well known of a brand as, say, Enkei or Volk Racing. 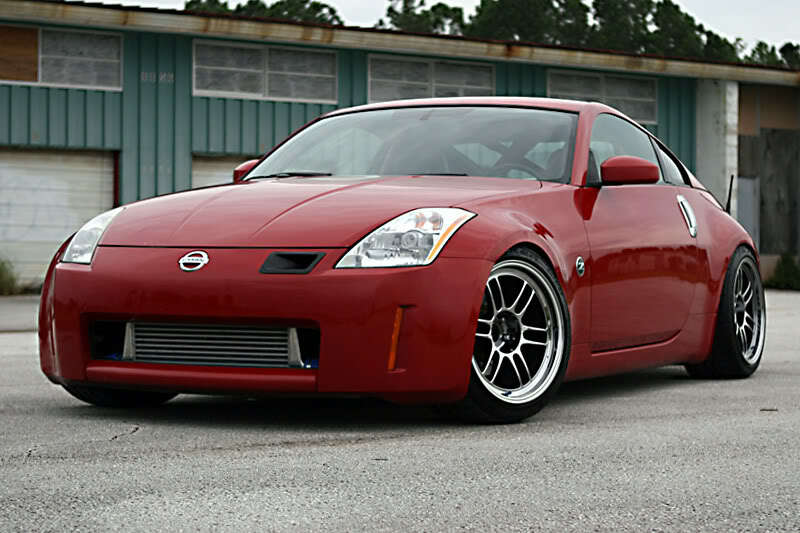 They come in pretty typical sizes for the Nissan 350z with 19×9.5 +22mm being our favorite. For those going for an aggressive stance, they offer an enormous 19×11″ wheel, which mean serious fender rolling, camber, coilovers and stretched tires. For the price, it’s hard to beat these wheels. Many 350z drivers don’t like them because they weigh over 25 lbs, but if they are only being used for daily driving, they’re a pretty solid option. It’s up to personal preference, really, and whether you plan to hit the track or not. These aren’t forged wheels, but onlookers will never know. The Volk Racing CE28N wheels by RAYS come in both 8-spoke and 10-spoke designs, with a bunch of cool, glossy colors to choose from. There’s no subtlety with these wheels: these are racing wheels through and through. Even though they come in limited options, they’re still some of the most popular wheels that 350z drivers use (anything by Volk is, really). Like other Volk Racing wheels, these are forged from monoblock construction, meaning they aren’t cheap. Both the 8- and 10-spoke designs are popular for racing, as they’re strong and lightweight. In fact, these wheels are even lighter than the TE37s (and most other wheels on this list!) at just 17.76 lbs at the 18×9.5” size. We began with Enkei, so we’ll end with them—it’s only appropriate since they’re the most popular wheels manufacturer for the 350z, bar none. The NT03+M wheels are some of the best rims for Nissan 350zs that are hitting the autocross track. These wheels come in just one color (Silver) and one diameter (18”), though there are various widths and offsets you can choose, depending on what your car is built to do. These wheels were designed with a perimeter brace ring that makes them strong and sturdy. They’re very popular for tarmac rally cars as they can take some serious abuse. They won’t distort easily from things like bumps or scraping against curbs. Like most other Enkei wheels, they’re also very lightweight. Since all of the wheels listed are great for racing and daily driving, it’s nearly impossible to pick a wheel based on those two criteria alone. The cheapest rims on this list come in more size options than the other cheap ones (XXR 526). They look awesome with over 11 different color options and a classic 6-spoke design, so you can still stand out even if you’re on a budget. 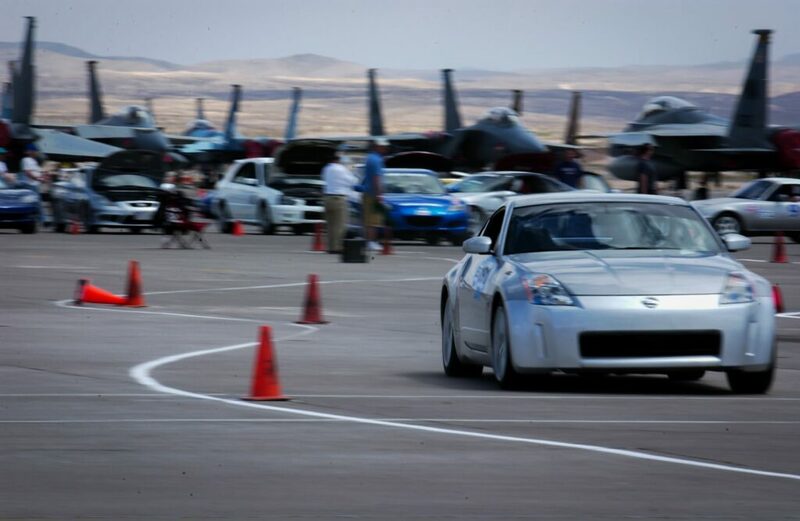 The most popular 350z wheels are also the lightest and some of the sturdiest, making them great for racing. They come in many different sizes and offsets, and will shave a whole lot of weight. They’re right in the middle of the pack in terms of price. For a wheel that is so good for racing, they’re actually really good value. That doesn’t mean they are “cheap” though. These are the official wheels of the McLaren Honda Formula One team, is that’s not confidence enough, we don’t know what is! With its unique glossy face and polished lip from RAYS’ diamond cutting process, that also gives them a mirrored look, these are simply the best looking wheels on the market. They’re sure to turn heads. If you have the budget, they’re also great for racing, since they’re some of the lightest and strongest out there. A true do-it-all-wheel, ready to win race day on Saturday and show day on Sunday. Know of any super special 350z wheels we might have left off? Let us know by leaving a comment!